It's easy to fall in love with Queenstown. The South Island town pitches woo from every angle – from the tops of the Remarkables to the valley-dwelling Otago vineyards. Three days in Queenstown is really just a fling, but that's all it takes to spark a life-long romance. Queenstown is famous for donning her wintry best – sloping curves frosted in white and fireplaces in full roar – but summertime in alpine town is something else. The rivers run deep and fast, the days are a little longer and slower. It took all of an hour in Queenstown before I started contemplating a schedule change or possibly a permanent relocation. Unfortunately, it was smack-bang in the middle of a South Island road trip and 72 hours was all the time we had together – the important thing was to make it count. The Hotel St Moritz was a big reason I was instantly smitten with Queenstown. Anybody who tells you accommodation is 'just a place to sleep' clearly hasn't stayed in an MGallery hotel. Once you do, you're spoiled for anything less. If you're after a little more space and seclusion, however, consider booking the Kohara Lodge holiday home. Hotel St Moritz is a 5-star, full service hotel complete with outdoor hot tubs, sweeping views of Lake Wakatipu, and exquisite on-site dining . Check-in to your temporary alpine residence and slip on your comfy shoes ready to explore. The gracious concierge staff will provide a handy map to navigate to and from the hotel. Set off on foot and make your way into town, keeping an eye out for paragliders floating down from the pine-speckled Bob's Peak. Downtown Queenstown is delightfully quaint, filled with a mix of boutiques, souvenir shops, on-trend cafes and adventure tour operators. Top choices for lunch include local burger institution Fergburger and upmarket Botswana Butchery. With a full belly and your bearings of the city centre, head back towards the foothills of the mountain and take a detour down Brecon Street. Riding the Queenstown Gondola is a must. Far from cliché, it offers unparalleled views of the lakeside town. You can purchase your gondola tickets in advance and combine them with a luge ride. After one windswept whoosh down the hill, you'll wish you had purchased the five ride pass. It's outrageously fun. After a leisurely introduction, it's time to get out of Queenstown – but not too far. Hiring a car for your South Island escape is highly recommended as it allows you the freedom to day -trip to the likes of Glenorchy, Lake Wanaka and, closer still, Arrowtown. 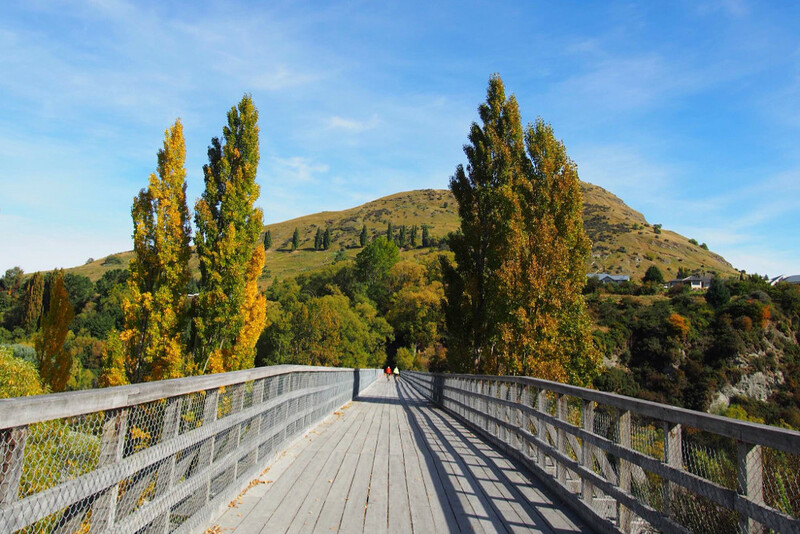 A memento from the gold rush era, the historic hub of Arrowtown is located just 20 minutes from Queenstown and is utterly charming with its quaint cottages and leafy boulevards. It's also at the heart of the Queenstown Trail and the perfect launchpad for swapping four wheels for two. Hire a bike in Arrowtown and hit the trail towards the Gibbston Valley wine region, just a few clicks down the road. The greater Central Otago wine region is home to some 200 vineyards within a 90-minute drive of Queenstown with Gibbston known as the 'valley of the vines'. Pinot Noir dominates the Otago vineyards and never fails to garner international acclaim. Cellar doors to knock on include Amisfield Winery, Coal Pit Wine, Gibbston Valley Winery, Peregrine Wines and Brennan Wines. Make it a full day of indulgence by booking dinner at the Lombardi restaurant at the Hotel St Moritz – the venison loin is highly recommended and pairs perfectly with an Otago red. For your final hours in Queenstown, join the locals down by the lakeside or surrender yourself to the splash zone on a jet boat ride on Lake Wakatipu to beat the summer heat. Of course, Queenstown's most iconic jet boat ride actually takes place on the Shotover River about 10 minutes from town. Even if you'd prefer to stay high and dry, the stunning Shotover area is worth a visit. Take a spin down Tucker Beach Road to the historic Old Lower Shotover Bridge, where you can soak in the panoramic views of Queenstown in all its summery splendour and watch the Shotover Jet Boats in action. You might choose to continue your scenic spectating further along the Gibbston Highway at the Kawarau Gorge Suspension Bridge, where adventure-seekers suspend their fears at the iconic bungy jump site. Secure your spot for dinner at Madam Woo for hawker-style Malaysian cuisine, or The Bunker for underground wining and dining. One last glass of Otago red and a toast to Queenstown is a must.